Why place Travel Ad in Sikkim Express Newspaper ? Travel ads are employed by travel companies to inform readers about their latest developments and newest deals. Man’s universal love of travelling ensures that vehicles for rent are always in demand, irrespective of what season it is. Get access to the lowest advertising rates and the most enticing combo offers over the internet via releaseMyAd, all while not incurring any additional charges. You can track the progress of your ads online during every step of the procedure until your ad is processed and ready to be printed. You can clear your advertising bill by having your pick from a number of online & offline payment options, including cash collection from home, which is available only in select cities. • Available six nights for sale in zest mahindra holidays no weekends ct.9830629298. • Darjeeling,Sikkim or Dooars?..1st time ever online cars,hotels,guides,packages booking 9830629298. 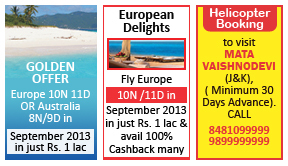 How To Book Travel Ad in Sikkim Express Newspaper ? View advertising rates and select the location of your choice. Compose your ad. You can take a look at our sample ads to compose efficiently. Select dates and clear your bill via a host of online & offline payment options. Once aware of travel rate card of Sikkim Express proceed with your Travel online classified booking. To know more about travel ads, click on the tab that says “Additional Information”. If you wish to book your ads now, scroll up to view rates. Now view rates & book your travel ads on Sikkim Express in a simple online process!